Scouts working behind the scenes have been brought into the spotlight thanks to prestigious awards. Romsey Scout members John Mason and Les Herbert have received awards for distinguished long-term service – the Silver Wolf for John and the Silver Acorn for Les. The Silver Wolf is rarely given for less than 30 years service and the Silver Acorn for less than 20 years. 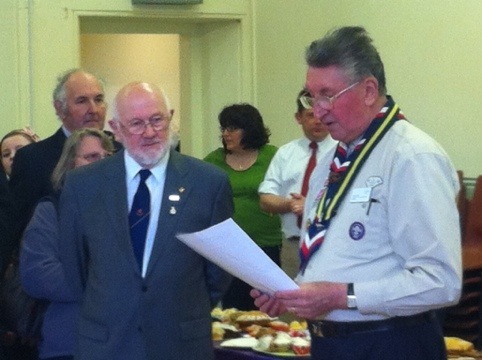 John Mason has been involved in Scouting for more than 65 years. Thanks to the award he is automatically able to attend the National St George’s Day service at Windsor Castle. John became a King’s Scout in 1947 and started his Scouting career in Romsey as a Scout Leader here at 10th Romsey in 1967. The 82 year old, who was a Parish Councillor for 12 years and a Governor at Mountbatten School, took on the role of Romsey District Commisioner in 1983. John was a Trustee of 10th Romsey until 2010 and he has been a member of the Hampshire County Executive since 2004. 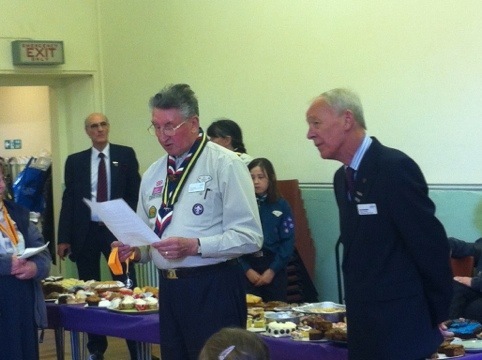 Les Herbert has been supporting Scouting at 10th Romsey for many years. His adult career in Scouting started in 1966 in Essex. Les joined the 10th Romsey Group Executive in 1988. 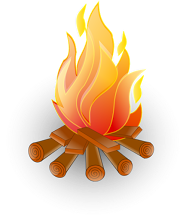 He was Group Chairman for some years and after retiring in 2009 Les took on the role of Group Secretary and has spent time researching the history of our Scout Group. Les has recently spent countless hours overseeing the recent grounds improvements at our Woodley Scout HQ. Seven Awards for Merit, recognising outstanding service, have also been given to Romsey Scouts. These wen to Ian Logan from 21st Nursling and Rownhams, Les Mildon District Apointments Secretary, Barbara Knight District Badge Secretary and Colin Knight District Executive. Liz Holloway, a member of the Romsey District Executive is another recipient along with Sheila Caine former Romsey Guide Divisional Commisssioner. Congratulations to Andrew Pudney, Scout Leader at 10th Romsey Sirl Troop, who was another Romsey recipient of the Medal of Merit. Thank you to The Romsey Advertiser for their permission to use content from their article which was originally published in the 13th April edition.